The default position is under the element. It looks best position. But, it is not sometimes. For example, it overlap pulldown list of select, or it is too lower position under the high textarea. Load the jquery.ui.tooltip.altposition.min.js script file after loading jquery.ui.tooltip.js etc. The altPosition is added to Tooltip options. It accept the Object which can have following properties. 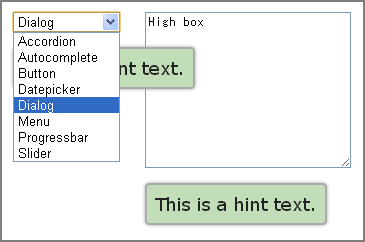 The position is altered to altPosition.position (alternative option.position Object of Tooltip) when any following conditions. The tag-name of the element is altPosition.tagName.